The preface and introduction are clear and concise. They convey what the book is all about and whom it caters to. Schools, the book tells us, are not free of the social and political contexts they are located in. Like children, they have a life beyond textbooks. This is the life the book focuses on. More than a book that talks of ‘schools that educate differently’, this is a book about school leadership. A book meant for practitioners, which addresses the need of the hour. The language is simple, direct and free of jargon. It will not only help school leaders and aspiring school leaders to avoid reinventing the wheel but also to raise questions. Questions that give birth to fresh thoughts and ideas. Ten case studies (each a different school) from across the country, primarily from the western states, have been placed together. Collated over a period of 10 years these case studies present a positive picture, one that gives hope. They talk of a diverse set of schools – crucial in today’s time when more and more schools appear to be functioning in a similar fashion. Annexures appended to the chapters share further details and learning is summarized in the final two chapters. The schools discussed are not the elite schools that the majority cannot afford. These are, however, fairly large schools with student numbers ranging from 1,000 to 5,000. It also helps that the case studies are recent – the schools belong to the recent generation. They face challenges different from those of their better-known predecessors. These case studies detail how they met these challenges. The message that the reader gets is that if it is possible to catalyze positive change in such large yet diversely set schools it can surely take place in relatively smaller schools. There is something to learn from each case study. One had taken up an exercise to plan major changes in the school’s functioning – this was done over a year by freeing select teachers from teaching during the period. Another school works in two separate shifts – one for children staying less than five kms away and another for those staying beyond five kms. Yet another school administers two sets of question papers. The idea is to ‘enable the less bright children to do reasonably well’. These actions are location specific but they make the readers aware of the possibilities of what they can take up in their schools. Editing though could have been crisper. Three of the ten case studies are long, 45-50 pages each. The initial two chapters together take up 45 pages. One wonders about the need for the chapters in this form especially when the author points out that the book is meant for ‘educational leaders, heads of schools and policymakers’. 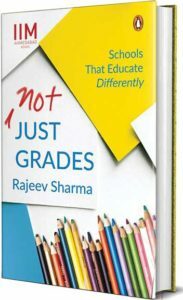 The author takes a conventional route many a time like when he states that music and arts help enhance academic performance. Can we not have music and arts for their own sake? He also appears to have taken a neutral approach in the case studies. While he appreciates the leadership he neither questions nor flags the grey areas. At one of the schools, a well-known personality is placed on a pedestal and appears to be calling the shots while his role is unclear. At another school, ‘children were beaten up mildly if they did not change through persuasion’. The book does not delve into environment education (discussions on sustainability) or talk about the impact of mobile phones on students (and the resultant impact on schools) or Right to Education – areas many schools today face dilemmas in. One wonders if this has to do more with the author than with the schools themselves. All said and done this is a book that talks about schools which took the initiative to react to the changes around them, rather than wait for the world to change. At the same time they also stuck to the basics – like to the adage of schools being only as good as their teachers. This was achieved by employing a mix of approaches and enabling linkages. In a nutshell the book underscores the need for clarity in management and dynamism in leadership, and the need to be open to change and innovation as well while not losing sight of the thumb rules. This is a book that school leaders and aspiring leaders will do well to read. The reviewer loves long walks, silences and both of them together. He blogs at http://nimesh-ved.blogspot.com/ and can be reached at nimesh.explore@gmail.com.